I haven't tried this in over 10 years, so when I saw some pictures done using this technique, I thought I'd try it again. All colours are made up of a combination of the 3 primary colours - red, yellow and blue. 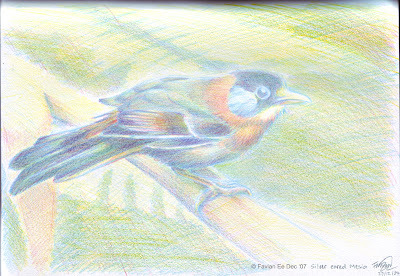 By just using those 3 colours of coloured pencils and cross-hatching, you can achieve all the colours of the rainbow. My secondary school art teacher taught us this technique in the early 1990s. I recently visited her home last week and saw some pictures done by her husband (local artist Chin Oi Tow) in this manner. So when I got the chance during my trip to Fraser's Hill, I tried it out for this picture of a Silver Eared Mesia and this is the result.